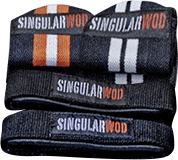 Weightlifting wrist wraps with neoprene. Improve your grip in exercises where forearm strength can be a limitation. Essential accessory for a better grip and avoid problems in the palms of the hands. Weightlifting bandages for maximum care of your joints. Additional grip without magnesium for comfort for squats, Pull Ups, Curls and other exercises. Improve your grip and prevent your hands from suffering. Grips 2 holes that will help you optimize your movements functional exercises.